I am self-confessed anti-Valentine. 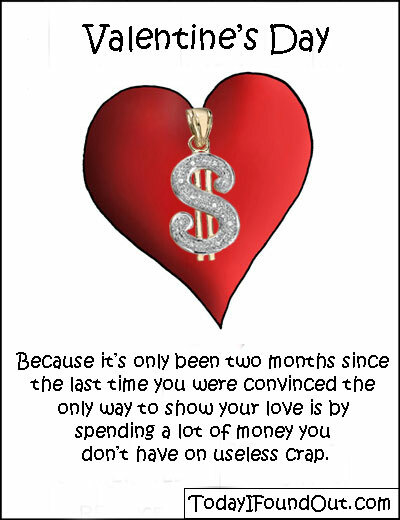 Don’t accuse me of being unromantic or a Scrooge as I’m neither of those. I can buy roses and chocolates with the best of them and I can wine and dine my woman like no other. I don’t believe that I should be letting someone dictate what day I should be doing those things. I am the one in love, I should know when to show love and appreciation to my better half. Valentine’s day to me is what I call a make-up day. It’s a day where dead beat spouses, men in most cases, get to pretend they are the best spouses ever and trick their other halves into believing it. Chocolate and jewelry make everything better. Or seems better. Or better to swallow. Seriously though, I have tried my best to buy into this commercial holiday. I try ignoring the reason behind the day. (Sales of course!) I chalked it up to my being a conspiracy theorist. I tried but can’t get over the hump. I still don’t buy in. My wife has tried to get me to subscribe also. She does all the little things that make Valentine’s day special for loved ones and I appreciate them very much. It would have meant even more to me was it done spontaneously, like on an ordinary day. Whenever I do or attempt to do something sweet for Valentine, I feel like a fraud. It somehow feels fake. It’s like saying, I am doing this because it’s Valentine’s and I’m supposed to do it. I love spontaneous but there’s none in that, is there? Before I say too much and piss off you folks who live and die for Cupid’s day, I will take my leave. Have a happy Valentine’s day from me, with love! I promise, I won’t say Bah! Humbug! to Valentine’s and for my wife’s sake, I sincerely do wish that I can find a little love in my heart for this day.